Sonos adds Google Play Music support | What Hi-Fi? Sonos has today announced the addition of Google Play Music to its list of supported streaming music services. The move brings not only the Google Play Music library of 22 million tracks but also the ability to stream your own personal music library to Sonos using Google's music library feature, which stores your music in the cloud. Also new is direct streaming from within the Google Play Music Android app to a Sonos speaker, the first time you've been able to stream to a Sonos speaker from outside the Sonos app. This is only available from the Play Music Android app, not the iOS app. Google Play Music is available now on Sonos in 25 countries worldwide, including the UK. Within the Sonos app scroll down to 'Add Music Services' to find the new member of the Sonos family. Google Play Music joins the likes of Rdio, Spotify and Qobuz on Sonos, with the announcement coming as part of "the year of software for Sonos". Last month Sonos confirmed we were unlikely to see any new hardware products this year. While the on-demand streaming music offering is similar across all platforms, though Qobuz notably aims to stand out by offering CD-quality streams, Google Play Music brings the advantage of access to your own music library. Sonos already offers this as a general feature, allowing you to use a NAS (network-attached storage) device to store your music which, once connected to the same wireless network, the Sonos app can then see, control and stream around your home. 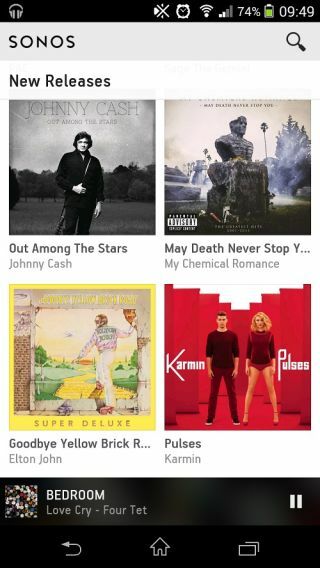 Google's music service has a cloud storage function built-in, allowing you to upload, store and play up to 20,000 songs, free of charge, whether you're on desktop or mobile, over WiFi or a network/3G/4G connection. This feature carries across to Sonos, meaning you can access your cloud-stored music library from withing the Google Play Music section of the Sonos app, seemingly negating the need for a NAS device on your network. However, while Google Play Music's supported file formats include Apple Lossless (ALAC) and FLAC files, as well as AAC and MP3, they are currently transcoded to 320kbps MP3 files when streaming. So it looks like a NAS device would still be the way forward for streaming CD-quality tracks on Sonos (incidentally, there's no high-res support on Sonos, so CD-quality is the maximum). Elsewhere on the Sonos Google Play Music app there are custom radio station options ("I'm feeling lucky radio" is a one button play of music Google thinks you'll enjoy), plus the ability to browse new music and store playlists. While Sonos has allowed direct streaming from the Android and iOS versions of the Sonos apps (now under 'This Mobile Device' on the new Sonos app), this is the first time that users have been able to stream directly from a third-party app to a Sonos speaker. The Play Music app now has a 'Connect to device' logo, the same logo as seen on the YouTube app when streaming to a TV or Chromecast, which allows you to see all your Sonos speakers/zones, connect to one, and play music. You can then adjust the volume, play/pause and select tracks, all from within the Google Play Music app. You can't however link speakers to play in multiple rooms and access related multiroom features, so you need to go back to the Sonos app to do that. Last month Sonos revealed its new look remote controller app, currently available in beta on Android, and it seems the company has plenty more lined-up for 2014. The Sonos wireless hi-fi family includes the Playbar, Play:1, Play:3, Play:5 and Sub, as well as the Connect, Connect: Amp and Bridge.